The most recent United Kingdom current account deficit figures have attracted relatively little comment. This is somewhat surprising, since at 6 per cent of GDP the deficit is the joint highest since the Office for National Statistics records began in 1955! It is widely held that a country’s current account enters the danger zone for sustainability at around 5 per cent of GDP. Indeed, the 5 per cent limit is often taken as an early warning indicator for crises in emerging economies. There are of course fundamental differences between the UK economy and emerging economies and the UK certainly isn’t facing an imminent currency crisis. Nevertheless, in several ways these figures raise serious questions over the UK’s economic prospects. This record deficit has occurred at a time when economic activity remains subdued and consensus estimates point to a significant output gap. 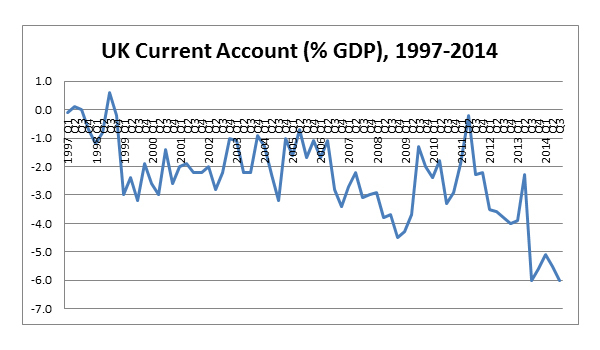 In the past large current account deficits have typically been associated with overheating in the economy – the only previous occasion when the UK had a comparable deficit was in the late 1980s at the height of the Lawson boom. This suggests that continued economic recovery is likely to lead to an even larger deficit. The Coalition government has explicitly aimed to rebalance the UK economy away from reliance on private consumer expenditure and towards a stronger trade performance in manufacturing and knowledge-intensive services. However, the current account figures and forecasts are not encouraging here. The UK’s current position should be seen in the context of a loss in its market share of export goods from the late 1990s; this trend has been particularly marked from 2013 onwards, with the relative appreciation of sterling. The Office of Budget Responsibility (OBR) has accordingly revised down its forecasts for export growth and foresees a continued loss of world market share, albeit at a slower rate. The OBR also still expects to see an improvement in the trade balance over the next five years, largely as a counterpart to the projected fall in the budget deficit (rather than rebalancing the UK economy, consumer expenditure is predicted to grow and household borrowing is predicted to rise further). The mechanisms to achieve this remain questionable, with the OBR assuming that improving productivity will boost UK exports. Yet the UK’s productivity performance remains weak. There is little prospect of favourable exchange rate movements: the euro has weakened and quantitative easing by the European Central Bank is presumably designed to depreciate the euro further. Moreover, as SPERI research has showed, falls in sterling earlier in the 2010s only led to limited improvements in export performance as many companies used a lower pound to raise their margins rather than expand overseas sales. The balance on services imports remains strong, although not sufficient to offset the deficits on trade in goods; nevertheless, the UK has the strongest services trade positon of any major economy. It should be borne in mind, though, that this also reflects very low imports of services. Whether services exports can expand further to compensate for any worsening in the manufactures balance remains unclear and will partly depend on international agreements on services trade. The position of the City of London faces competitive challenges and the development of UK government policy may help, but will more probably hinder, the country’s strong position in higher education. There is a further interesting development with the UK current account in the form of a marked deterioration in the primary income balance since the start of the financial crisis. This is defined as the difference between income earned by UK residents from investment abroad and income earned by non-residents on their UK investments. In the late 1990s and 2000s before the crisis, although the UK’s net international investment position was negative (foreign ownership of UK assets exceeded UK ownership of assets overseas, the inevitable result of persistent current account deficits), the primary balance had been positive. UK assets overseas received at that time a higher rate of return than foreign asset holders received on their investments in the UK. Much of this reflected relatively high rates of return on UK direct investment (investment by UK-based multinational companies), but latterly rates of return on UK companies’ overseas investments have weakened. There was something of a rentier economy element here, deficits elsewhere on the current account being offset by strong overseas investment earnings. These rates of return are volatile and not well understood; the United States has, for example, long enjoyed a similar rate of return differential on overseas assets, but the UK’s advantage here may be receding. The broad point is, however, that the UK’s current account has now deteriorated to levels often believed to be unsustainable without counteracting responses. Furthermore, whereas during the various post-war ‘stop-go’ economic cycles balance of payments problems emerged during periods of expansion, unprecedented deficits have now emerged whilst there still remains substantial slack in the economy. There is little immediate prospect of a fall in sterling, let alone one of the magnitude that might be required to restore balance. Further deflation to reduce demand for imports also appears unpalatable. The post-war trend of a deteriorating manufacturing balance being only partially offset by a strong services trade performance has continued and the prospect of services exports growing sufficiently to compensate is uncertain, to say the least. A rebalancing of the UK economy would require a far more thorough-going industrial policy than has been attempted by successive post-war British governments, including of course the present office-holders of the Coalition. Can we expect anything different from their successors, whoever they turn out to be?